We the Ohana of Our Lady of Mt.Carmel Church stand united as a committed multicultural parish in prayer and faith; with the power of the Holy Spirit, and the intercession of the Blessed Virgin Mary;to evangelize in the service of God, by sharing the good news of our Lord Jesus Christ in our words and actions with the hope of eternal salvation for all. 1st Monday of the month after 6:30PM mass (7:00pm to 7:00pm Tuesday evening). There is a sign up sheet at the front of the entrance of our church weekends before the 24 hour Adoration. 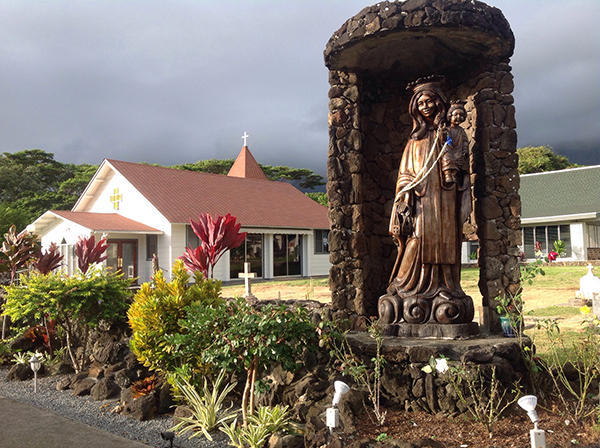 Note: Please check with our parish office by calling us (808) 239-9269, if you're from out of state or visitor from neighboring islands, because sometimes there is a need for us to change the 1st month date...rarely happens but please note it can happen due to holiday schedules, priest unavailablity, or unforseen causes that occur. Mahalo for your understanding! *Observed Holiday's Office will be closed.